Written for the International Fuzzy Bathrobe Challenge. John admitted later that they picked a bad time to visit PX7-501. John admitted later that they picked a bad time to visit PX7-501. The climate was cold anyway, and the Risians lived in snow-covered mountains, high above the tree line, in houses built right out of the cliffs, where it was hard for the Wraith darts to get in. John had to land the jumper on the floor of a gorge, and then they had to climb up to the cliffs on stairways chipped out of the stone. At the moment, everything that wasn't covered with snow was mostly encased in ice. "You have got to be kidding me," Rodney said, aghast, staring at the narrow icy steps weaving in and out of the stone. Even Teyla looked dubious. Ronon just looked grimly resigned. "This was your idea," John reminded Rodney, pulling up the hood of his parka. The Athosians had last traded with the Risians a few years ago, before the expedition had arrived. They had traded toba root for furs, some really nice embroidered blankets, and metal for knife blades. A few days ago, the Ancient tech team had discovered the metal was an important component in the process for recharging Ancient crystals. "So get moving." Rodney waved a gloved hand helplessly. "Can't they come down here?" Teyla lifted a brow. "Would you, if you were them?" "I know, but--" Rodney winced, giving in and stamping over to the stairway. "Oh, fine." The stone was icy and treacherous and they all slipped and fell at least once, though fortunately not off the stairs and down the gorge. They finally reached the last part, the easy part, where there was just a narrow wooden bridge, fifteen feet or so above a low spot filled with ice. It led to a big three-story Viking-like lodgehouse built of heavy wooden logs, tucked into a ledge on the side of the cliff. "Finally," Rodney gasped. The Risians, bundled up in heavy furs, waved from the balconies of the lodge. Teyla started to step onto the bridge and slipped, grabbing the rope handrail. John caught her arm to steady her before she slid into a snow drift. "Careful." "I'll go first." Ronon stepped out onto the bridge, moving slowly. The ice cracked under his boots, and John was about to step out after him. A louder crack was the only warning, as the wooden slats split and collapsed under Ronon's feet. He fell, and John had a second to think it would be okay, it wasn't a big fall, the worse they were looking at was a broken bone. Then Ronon hit the ice below and broke right through, disappearing into the dark water beneath; it wasn't just a low area, it was a frozen reservoir. Rodney shouted in horror, to a chorus of startled shrieks from the Risians. Teyla ripped off her pack, tearing it open for the rope, John dropped his P-90 and his parka and jumped after Ronon. John hit the water and it was so cold his brain whited out and his heart tried to stop. It took him precious seconds to get enough air in his lungs to go under, and that was worse. He couldn't feel anything. He tore off his gloves, but his hands were already numb. He just hoped the big thing that he was trying to drag up was actually Ronon. He broke the surface amid chunks of floating ice, pulling Ronon up by the hair. Ronon wasn't moving, wasn't breathing. John had to tread water to keep them both from sinking from the weight of clothes and weapons, knowing it was just making him lose heat and die faster. The walls were fifteen feet deep, he knew Rodney and Teyla couldn't possibly get them out, not without killing themselves. John thought, Way to go with the irony, John, come all the way from Antarctica to another galaxy to die of hypothermia under an ice flow. Then a wooden scaffold strung with ropes landed on the ice with a huge clatter, Risians scrambled out onto it in a flurry of fur robes, and there were suddenly a dozen hands grabbing John's tac vest straps, his jacket, Ronon's coat, hauling them out. The world faded out after that. John was lying on icy wood, the porch of the lodgehouse, so cold he couldn't feel his body, surrounded by frantic people. An old woman was kneeling beside him, her face so wrinkled he couldn't read her expression. She was patting his numb face, yelling urgently over her shoulder at someone. The Risians were smaller than he had expected from the descriptions, more Tibetan than Viking, and they were all yelling at each other, which felt just like home. Over the frantic shouts, John heard Rodney counting off the chest compressions for CPR. That's not good, he thought. Then a bunch of Risians closed in around him and everything went black again. The next time John opened his eyes, he came awake fighting because unfamiliar hands were pulling his clothes off. He was somewhere in a big firelit room, lying on a tile floor, surrounded by strangers. Then Rodney was there, grabbing his hair and shaking him, yelling, "It's all right, they're helping us!" John was shivering so hard his teeth were rattling. "Ow," he managed, because the grip Rodney had on his hair fricking hurt. Rodney let him go. He told the people around them, "It's fine! He's harmless! Just be careful and for God's sake don't startle him!" John remembered they had been doing CPR on somebody. He rasped out, "Ronon? Is he okay?" He must have lost time, because it was Teyla leaning over him now, answering, "He is well now. He began to breathe again after only a few moments. How are you feeling?" John swallowed in a scratchy throat. "Better." Less frozen, more thawed. He realized he was wrapped in warm blankets now, that he could feel heat radiating up through the floor, and he couldn't get close enough to it. He rolled over, trying to burrow into it, and faded out again. The next time John woke he was in a little room with candlelight and painted tile walls. He was lying on a pallet under heavy blankets, and the floor was warm here too. The door stood open and he could hear Rodney and Teyla talking somewhere nearby, sounding more exhausted than urgent. He remembered Teyla had said Ronon was okay. He closed his eyes in relief, then started coughing. His throat was sore and his sinuses felt like somebody had punched him in the face. He felt stiff and old and his joints ached like crazy. But all his fingers and toes seemed to be there and still working. It could be worse, John thought. He decided to get up and see how much worse. The getting up part turned out to be complicated. Under the blankets he was wearing clothes, which was nice, because he had a vague memory of being stripped of his wet frozen uniform in what was possibly the main hall of the house, with what had to be half the population of the planet helping or looking on. Now he was wearing a long-sleeved tunic-thing that went to mid-thigh, over something that was basically a floor-length skirt-like garment with four separate panels, one in front, one in back, and one to each side. Disentangling it from the blankets and figuring out that it was attached to his body took a while. 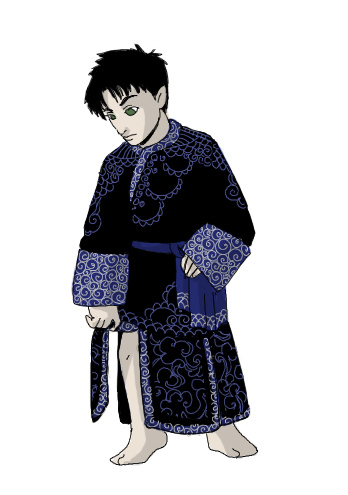 The fabric was black, embroidered over with thread so dark blue it was barely visible, and it was soft and clingy, and warm, despite the lack of pants. He had just managed to stand up when Rodney appeared in the doorway. "Hey," John croaked in greeting. He scrubbed a hand through his hair, then realized Rodney was staring at him. John looked down, but nothing was hanging out. "What?" Rodney started, lifted his chin, and snapped, "Nothing." He was still wearing his uniform, and he looked pale and tired, his hair sticking up in different directions. "Should you be up? You were practically dead, you know." "Whatever." John shrugged. He felt practically dead, but he didn't think lying there would help that. A Risian woman stepped in past Rodney, smiled at them, and handed John another bundle of fabric. She said, "There is a sleeping room for you, down the hall. Your wife is there." "Uh." She was already out the door. John looked helplessly at Rodney. Rodney waved it away. "Don't worry, she means Teyla." Okay, that was a relief. "So I'm married to Teyla?" John shook out the bundle, hoping this was the pants. It was a robe, matching the rest of the outfit, but made of heavier material, with thicker embroidery over the shoulders. Pants would have been nice, but this would at least make the skirt less obvious. He started fumbling to get it on. Rodney rolled his eyes, turned him around, and helped yank the heavy fabric up over John's shoulders. "We're all married to Teyla. Great Grandma the High Matriarch got it into her head and nobody can talk her out of it. And no, they don't have plural marriage in their culture, she just decreed that we do." That sounded like a job for Elizabeth and a follow-up diplomatic relations team. John followed Rodney out into the hall. The floor was polished wood out here, without the heating system of the other rooms, and cold on John's bare feet. Of course, cold was relative. Men and women in embroidered robes bustled up and down the hall, kids ran past. It was noisy and confusing and John had no idea if this was a village or one big extended family. Most of the people nodded and spoke to them in something that wasn't English. They were almost to their assigned room when a little woman that was about a hundred and fifty years old backed John up against the wall and said, "You need rest. You get back in bed." She threw a suspicious glare at Rodney, and added to John, "I check on you later." Rodney folded his arms, saying briskly, "Yes, you've terrorized us into submission, now please go away." He told John, "By the way, you're delicate and underfed, and we don't take care of you." "It's true," John solemnly told the old woman, figuring hey, he could always use an ally. She nodded sharply, and gave Rodney a satisfied parting glare. Rodney swore and dragged John into the room. Their sleeping room was small too, and unlike the hallway, it was blessedly warm. There was a little fireplace in one corner, with more painted tile, and in the other corner was a reassuring pile of their packs, tac vests, and weapons. Heavy fur rugs covered what little floor space there was, with the low bed taking up most of the room. Ronon was in it, bundled up in blankets, his back against the wall. He was snoring. Teyla was sitting by the fire, head propped in her hands. She looked up, smiling wearily at them. "John, it is good to see you awake." The last word ended in a yawn. "You okay?" John asked, and tried to sink down onto the rug next to her. But Rodney said, "Oh no, no, you don't," caught him under the arms and dumped him on the bed. "That insane harridan may have gotten her medical degree from Crazy Old Lady U, but she's right about this." "Oof," John said, tried to sit up, got tangled in all the fabric he was wearing, and flopped back down. It really wasn't worth it. Ronon stopped snoring, opening one eye in a suspicious squint. He saw John, grunted in recognition, and closed his eyes again. John said, "So. Did anybody think to ask about trading while we can still work the sympathy and guilt angle?" "They are very sorry about the bridge -- they think it was weakened by the ice storm yesterday -- and they will be happy to trade with us." Teyla smiled wryly. "I think that would have been the case even without the sympathy and guilt. Not many trading groups manage to make their way here." Rodney snorted derisively, pacing away in the limited space. "They owe us a hell of a lot more than that." John rolled over to squint blearily at him. "It was an accident, Rodney. It could have been Granny and the kids out on that bridge when it gave way." Rodney rounded on him angrily. "Poor maintenance is no excuse-- Oh, for the love of--" He stepped over and tugged one of John's fabric panels down. "Can you manage not to expose yourself in front of Teyla?" "Don't touch my skirt, Rodney." John curled up defensively under the robe. "Besides, I think she's seen a man's kneecap before." Snorting, laughing helplessly, Teyla fell over on the fur rug. "I will cover my eyes." Rodney flung his arms in the air. "You were both-- You were blue. Ronon was dead. We had to let them take care of you because we had to do CPR on Ronon, we were just lucky they knew what to do for hypothermia. If they hadn't-- You were blue." His shoulders slumped, and he added weakly. "And I have a headache." There wasn't a lot John could say to that. Ronon, woken again by the yelling, grumbled, "I wasn't dead." "You shut the hell up," Rodney snapped. Teyla pushed to her feet, giving him a warm smile. "Sit down and rest, Rodney. We have missed our check-in, and Major's Lorne's team will come for us soon." "Yes, it's going to be hilarious watching them try to arrange a med-evac from here," Rodney grumbled, but he sat down on the bed, shoving John over like an inconvenient pillow. Note to self, find pants before Lorne's team gets here, John thought, yawned, and dropped off to sleep again. Enjoyed the story especially for the description of the culture and people. I know John probably looked fantastic. LOL I would love to know what these people dressed Ronan in, since compared to them he is huge. I felt so sorry for poor McKay, worrying like that.